Aye, yer scurvy swab! Ye can yell a random pirate exhortation and/or enjoy pirate flavoured tooltips for pirate NPCs, spells, and items. Yells be perfect for carousin' with yer scallywag pirate buddies, especially during Pirate's Day. And Tooltips? Aye! There be plenty o' pirates throughout Azeroth 'n' plenty o' their booty to be sure. Most can be found south o' Booty Bay 'n' along the Southbreak Shore and Lost Rigger Cove in Tanaris. There be other places where pirates be found, such as Faldir's Cove. So get out 'n' find 'em or are ye a lily-livered poop deck swab? Instal: Like any other AddOn. Set up: Works 'as is'. For configuration enter '/yarrr' in chat. /yarrr to see a menu of possible commands. /yarrr r to randomly yell a pirate themed exhortation. These are from a different set to the Tooltip puns and jokes. Perfect for pirate themed parties and Talk Like a Pirate Day in Booty Bay! /yarrr 1 same as "r" above except that the exhortation occurs in General Chat. /yarrr d n where "n" is a number >= 15 and is the delay in seconds before a tooltip will be regenerated for an NPC/item/spell/faction. Default is 900, i.e. 15 minutes. This avoids constant tooltip spamming which can get annoying. A delay is also required as a technical work around for a WoW UI limitation. Yarrr is rated ESRB "Teen", as is WoW overall. Mild suggestive themes. No swearing. Alcohol. 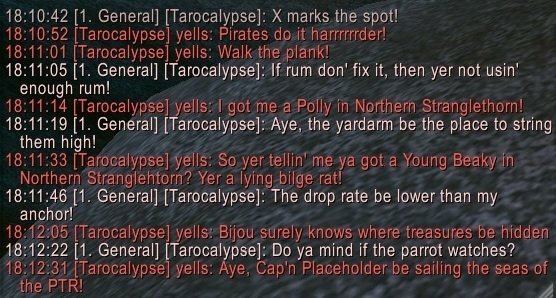 Aye, yer'll be spammin' "/yarrr r" and "/yarrr 1" during Talk Like a Pirate Day, every 19th of September. An' if yer don't then Cap'n Slappy and Ol' Chumbucket will get yer! Some yells refer back to game lore and some hint at finding companions and hunter pets. Mostly, it is all about carousing and pillaging! * The Dreadwake and Cap'n Crackers added. On ya Blizz, just in time for ITLAPD! * Pretty much anything Southsea, Blackwater, Northsea, Brashtide, Cutwater, etc is "in"
* Reminder to self: Great Sea Privateers / Greenbelly's Raiders / Briona's Buccaneers on BfA? * Added Monty - Deeprun Tram (Ironforge end), heck how did I not recall that one after all these years? * More puns and expressions!!! * Bill Buckler (Master Pet Tamer in the east coast near Booty Bay - wears Pirate garb) + his two "parrots"
* "Macro Commands" in the command menu, whilst technically correct, has been renamed to the more sensible "Commands"
* Version update to support Patch 7.1 "Return to Karahzan"
Yeah I got the update for BfA in time but not the new mount and pet, which players will get eventually anyway if they renew for a large time period. Hope everything went as well as possible in hospital. Being able to play WoW or whatever would be a really useful distraction and fun to boot. But over public wifi heck. Would be so frustrating. The lag!